On Tuesday, I praised good NYT reporting on CIT training in Portland, a piece that tried to go beyond the usual platitudes. Today, I'd like to criticize their most recent Room for Debate - on mental health facilities. The truth of a vast publication like this is that while there are overarching standards, it's made up of countless tiny little kingdoms, run with radically different visions. There is no "New York Times" to criticize, only individuals and departments (I frequently find critiques of my op-ed starting with "CNN says ..." which is pretty silly). And yet, it's a convenient short-hand. and Off the Streets. Accessible at this link. The essays aren't bad. Even the pro-asylum one talks about community care and supports Olmstead. 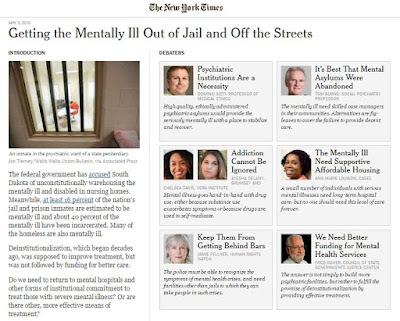 Jail diversion for people with mental illness is absolutely essential. But where are the self-advocates? I know so many people who identify as mentally ill who speak passionately on this issue. Some are radically anti-institutional-care. Others believe well-supported inpatient, even coercive inpatient, institutions are part of a robust continuum of mental health services. It's a unconscionable that the NYT would invite six people to talk about asylums without consulting any of the many experts who have actually been forcibly institutionalized or would be threatened with institutionalization under a new asylum regime. Side note: Recent research argues that labelling people as "The" mentally ill increases stigma - it's the definite article that does it - and yet it's consistent in NYT usage. Ultimately, if there's room to bring in six people to talk about an issue around disability, it's reasonable to demand that at least one of them be disabled. Self-advocates and people with lived experience really aren't that hard to find, but you have to start by looking.